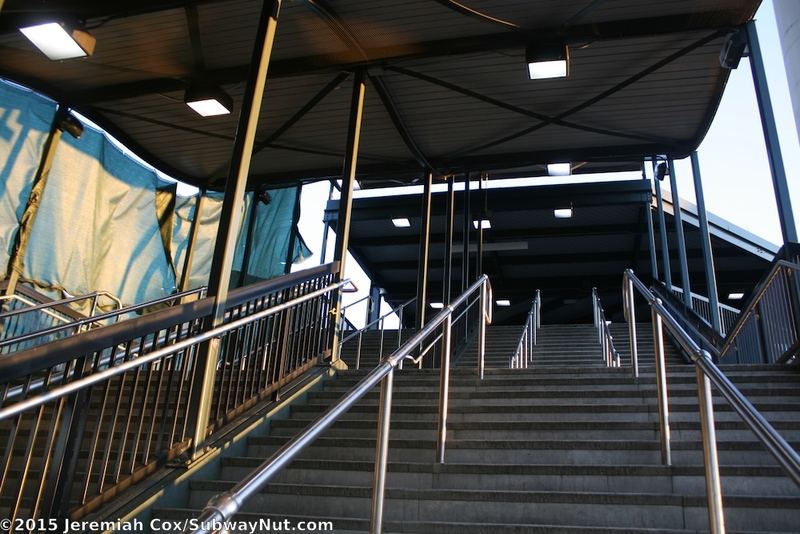 Yankees-E 153 Street Station opened as an infill station on May 23, 2009, during the first season of the newest (and current) Yankee Stadium. 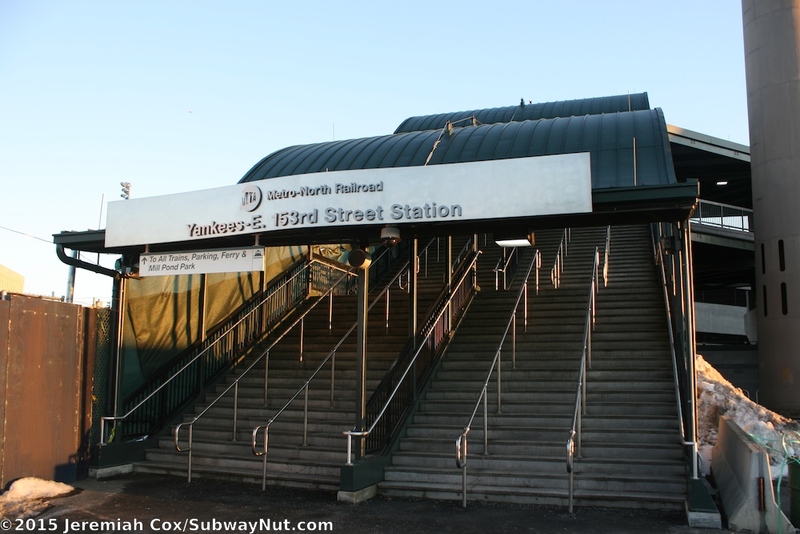 Trains on the Hudson Line have had passenger stops in the area before, most recently during the 2005 Transit Strike with temporary wooden steps as platforms. 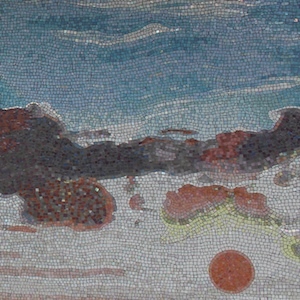 The cost of the modern facility was $91 million. The station receives service 365 days per year to serve the surrounding community of the South Bronx including the Borough Courthouses. 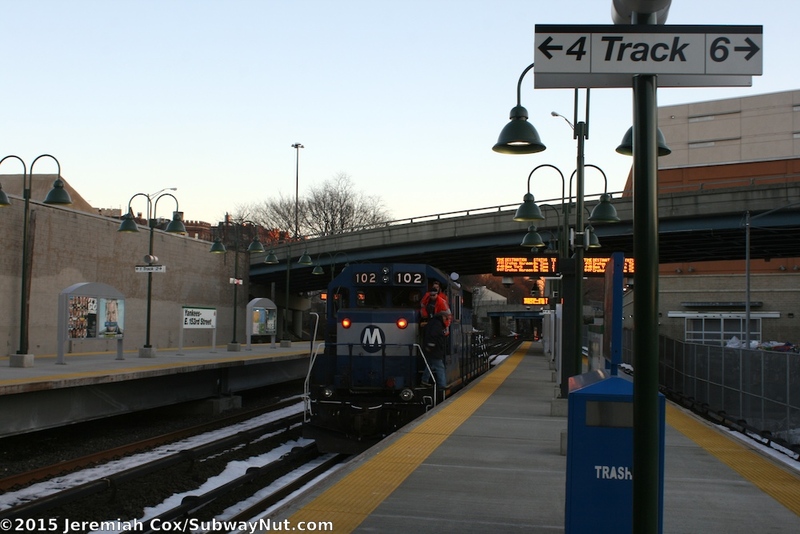 The Melrose Station on the Harlem Line (about three-quarters of a mile east from the station down 161 Street) also serves this neighborhood. In the 1960s the New York Central experimented with Yankee and Giants Football Expresses to Melrose Station telling fans to walk the half-mile to the Stadium. 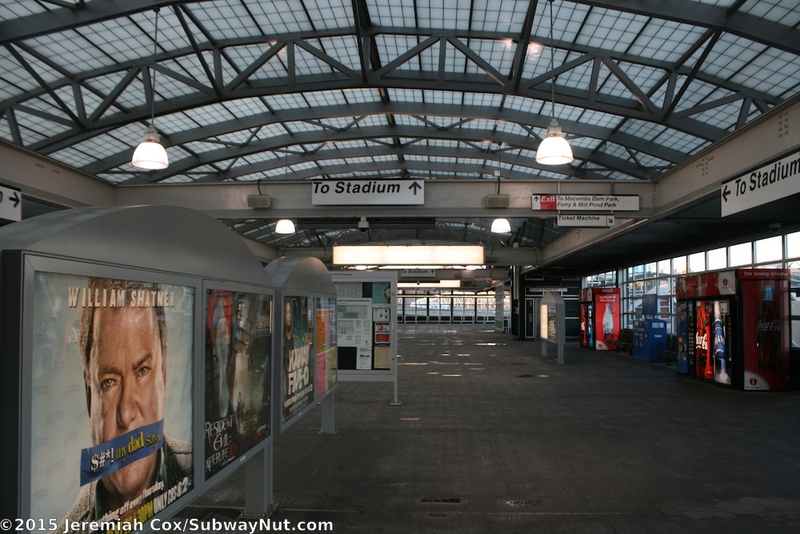 The station's non-game day base service is hourly local trains on the Hudson Line running to and from Croton-Harmon. This station is unlike the Long Island Railroad's Mets-Willets Point (formerly Shea Stadium) Station on the Port Washington Branch. This station is only in service on Mets game days and during the U.S. Open. 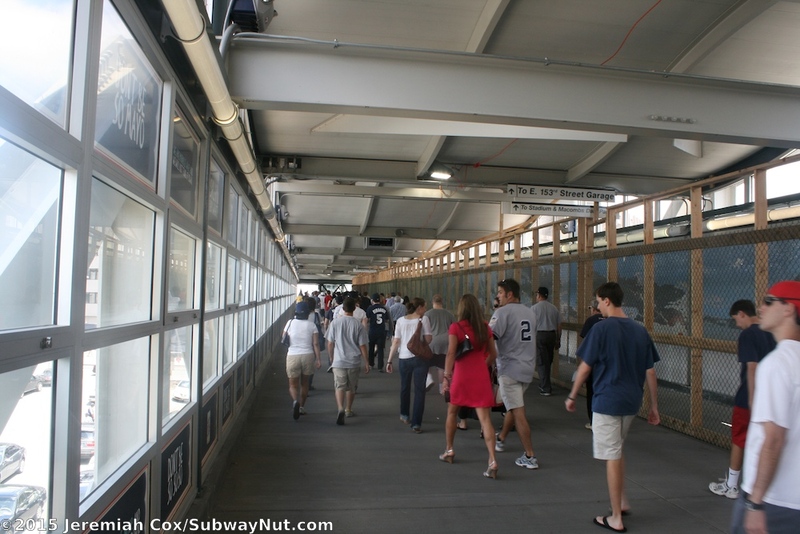 On Yankee Game days service increases dramatically, nearly all Hudson Line Trains add an additional stop at Yankee Stadium. Special Shuttle trains run between Grand Central and Yankee Stadium, stopping at 125 Street. Two additional express trains one from Poughkeepsie, one from Croton-Harmon (only stopping at Ossining and Tarrytown) operates. Special return Hudson Line "Yankee Clipper" trains (one a full local to Croton-Harmon, one an express to Tarrytown) depart 20-45 minutes after the game ends. 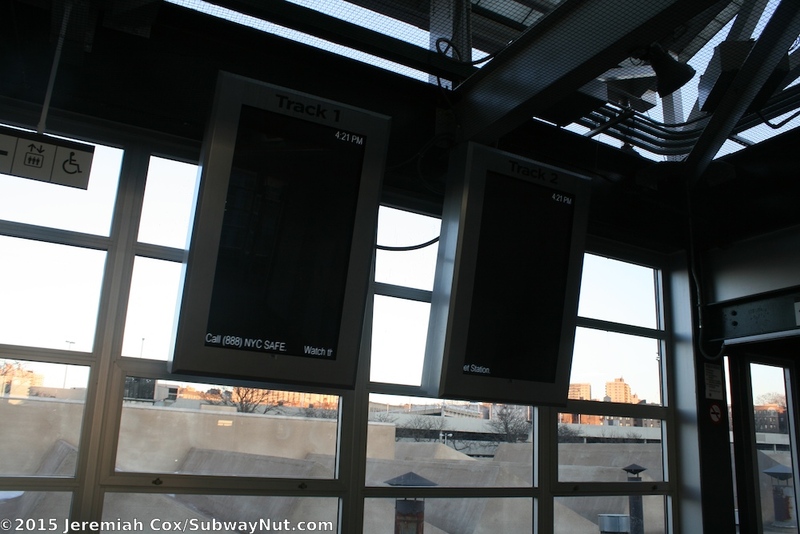 Finally, the New Haven and Harlem Lines receive special direct "Yankee Clipper" trains that run via Mott Haven Junction to most stations on the Harlem and all stations on the New Haven Lines. Trains serve all games except weekday afternoon games. As of the 2015 season, for weekday night games these special trains make 1 inbound trip from select stations on the New Haven and Harlem Lines, for weekend games there are 3 inbound trips to Yankee Stadium on the New Haven Line (1 is a Stamford Local and 2 from New Haven, express from Stanford), and two trips on the Harlem Line (the train runs from Southeast stopping at only select stations, not every stop receives service). Return service lacks a fixed time and trains simply depart 20-45 minutes after the game ends. There are 4 trips on the New Haven Line (2 locals to Stamford, 2 expresses to Stamford that become locals to New Haven), and 2 trips on the Harlem Line (from Weekday games this train makes every stop to Southeast, except in the Bronx, weekend games is the same select, higher-passenger stops as the inbound trains). 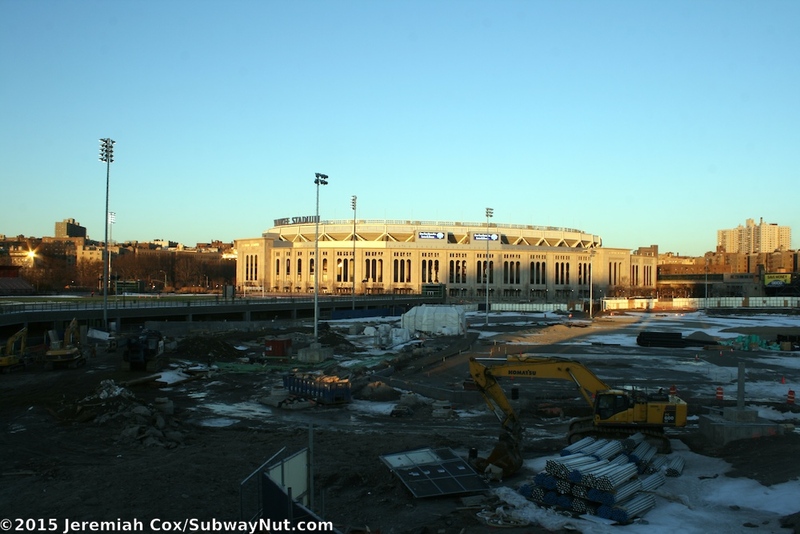 New York Football Club games at Yankee Stadium don't currently receive "Yankee Clipper" service. All Hudson Line trains make the stadium stop and a few Supplemental shuttle trains between Yankee Stadium and Grand Central also operate. 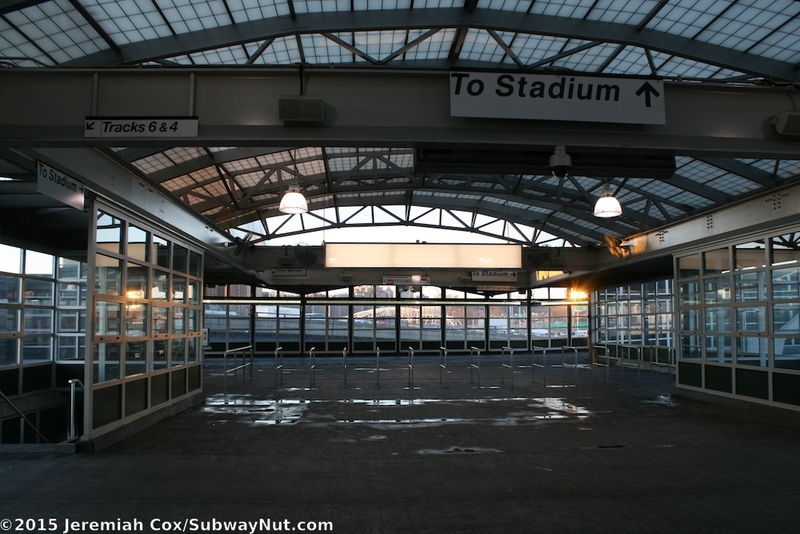 Fares to Yankee Stadium are unusual; on the Hudson Line the station is in the same fare zone as the rest of the Bronx, so cheap intermediate tickets are available. From the Harlem and New Haven Lines a more expensive VIA ticket must be purchased. The fares are a dollar on top of the regular high Grand Central ticket prices with regular Grand Central Monthly and Weekly Communication Harlem and New Haven Line tickets accepted. The station has been a resounding success at taking suburban Yankee Fans out of their cars. 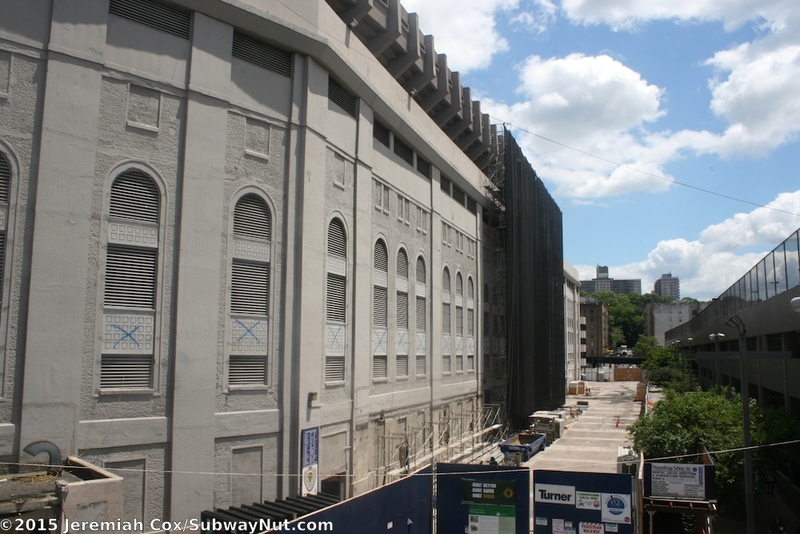 The building of the station is the main reason why the bonds for the new Yankee Stadium Parking garages are on the brink of default. The station is just south of the High Bridge Yard so staging the Yankee specials is extremely easy. It has four tracks with two ten-car island platforms that serve all four tracks. 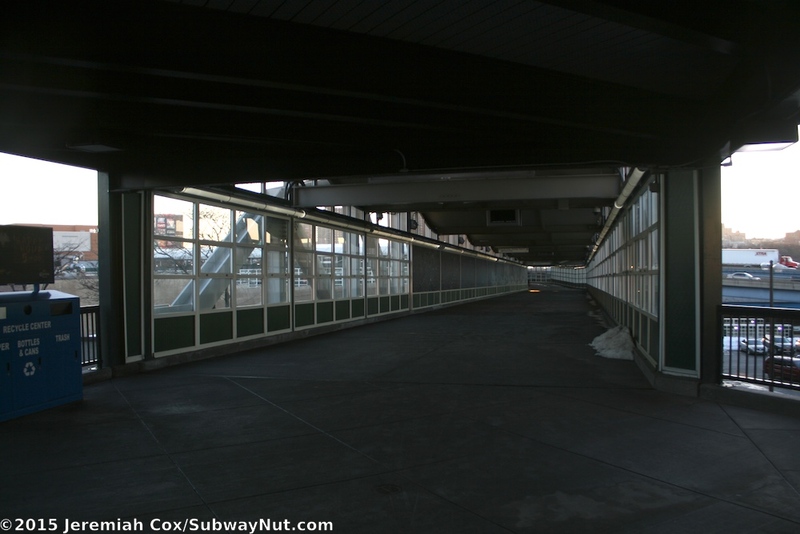 The station is located at ground level and the Major Deegan Expressway (I-87) crosses over the northern end of the platforms with two highway on-ramps over the middle of the platforms. 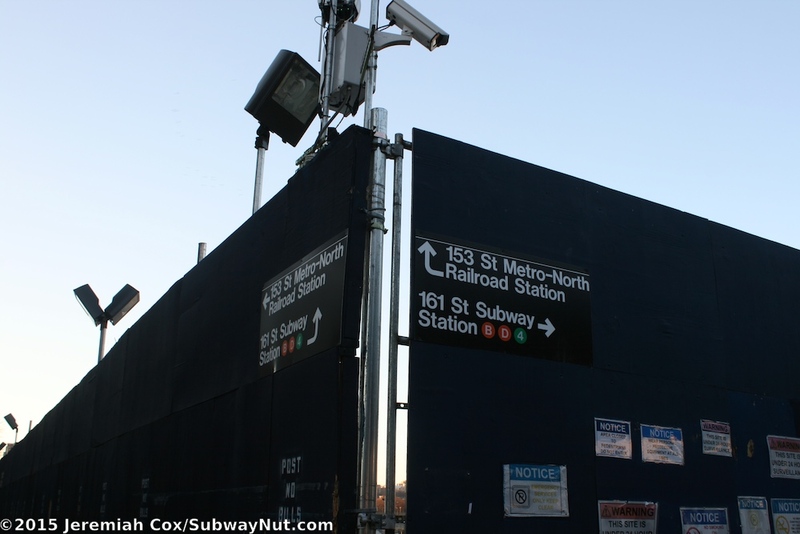 The platforms are mostly exposed to the elements with just a line of green lampposts, advertising panels and two lines of text under a green line Yankees-E. 153rd Street signs. 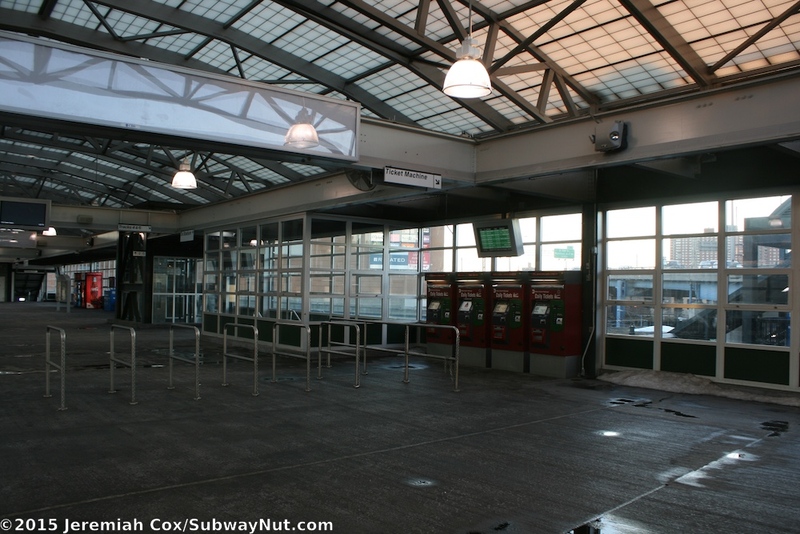 Just two small waiting shelters are along each platform. 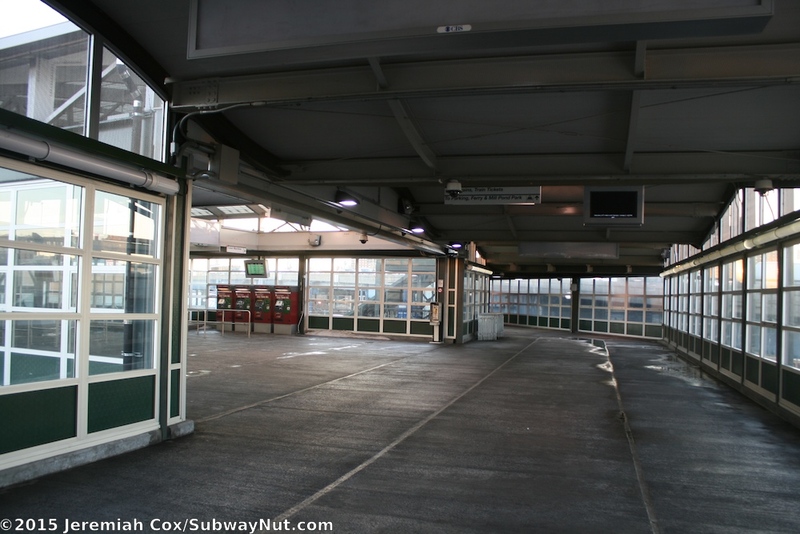 Except in the middle of the station where the platforms are covered by a wide mezzanine area. 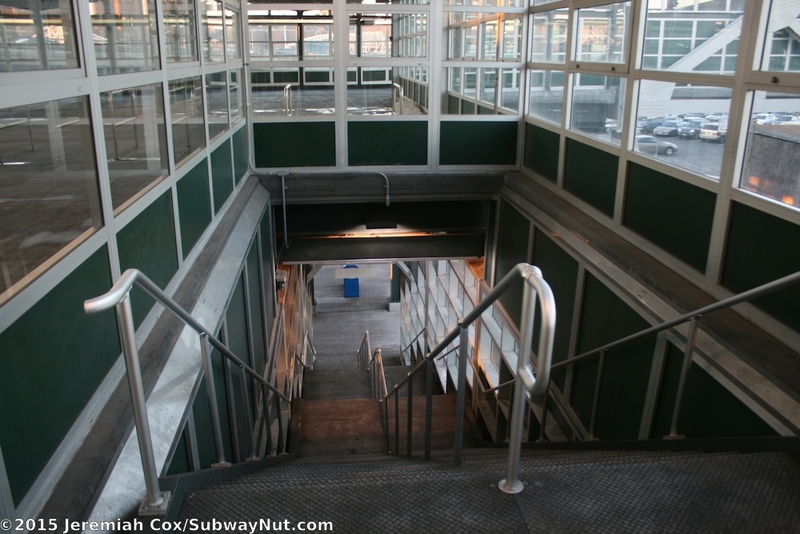 This airy mezzanine has two wide staircases and an elevator down to each platform. At its northern end by the exit is a line of circular posts that can be chained off. During game days station conductors stand at these posts and all passengers using the Yankee Stadium receive a second, in station ticket check. 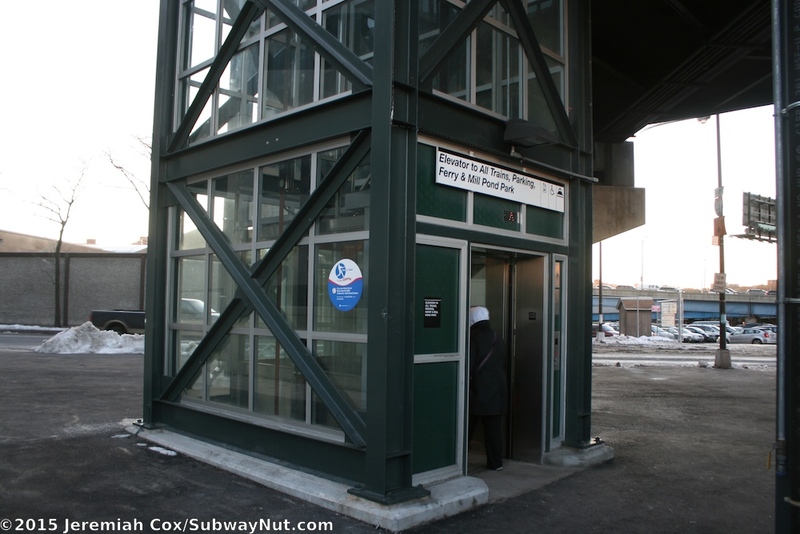 The leave the station a staircase and elevator leads down to a parking lot adjacent to the tracks with a walkway from here leads to Exterior Street/Gateway Center Blvd and a mall with vertical big box stores (Home Depot, Target and a few more), the Bronx Terminal Market, formerly called the Gateway Center. 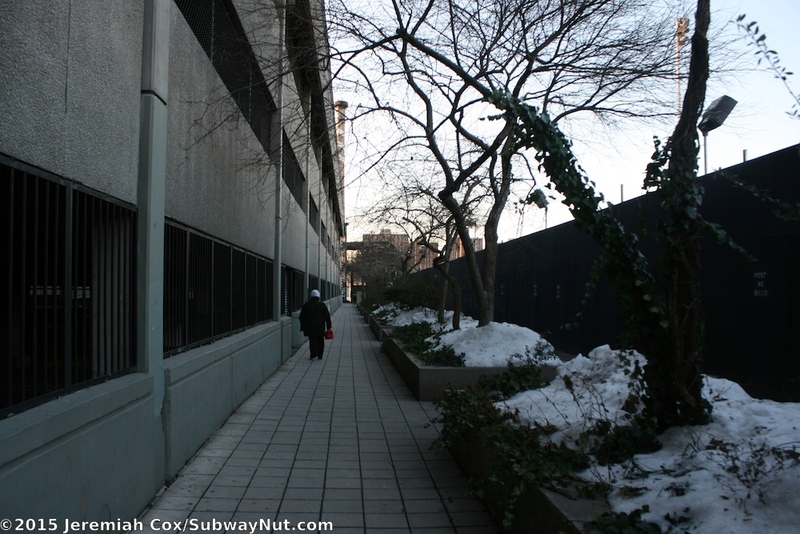 The Yankee Stadium ferry landing is across from this parking lot and exterior along the Harlem River (and under the Major Deegan Expressway). 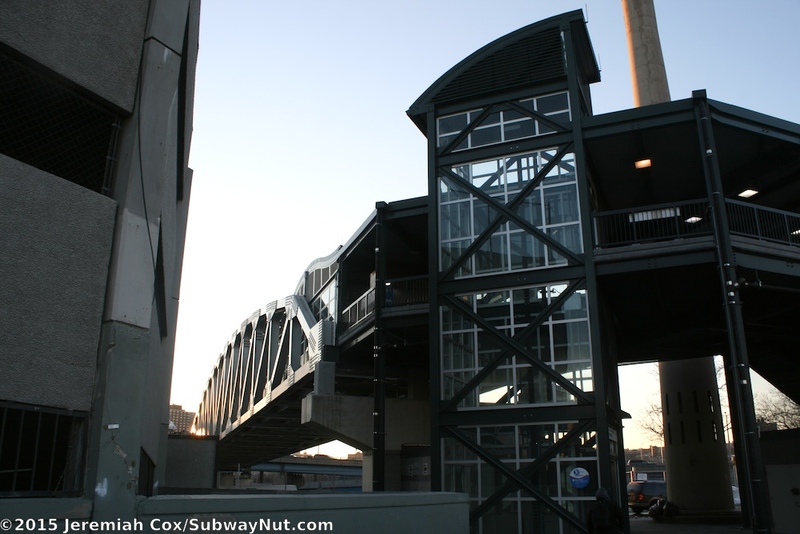 Ferry service to the stadium has existing since the 1990s when a much narrower walkway pedestrian bridge was built across the Metro-North Tracks along with the dock. 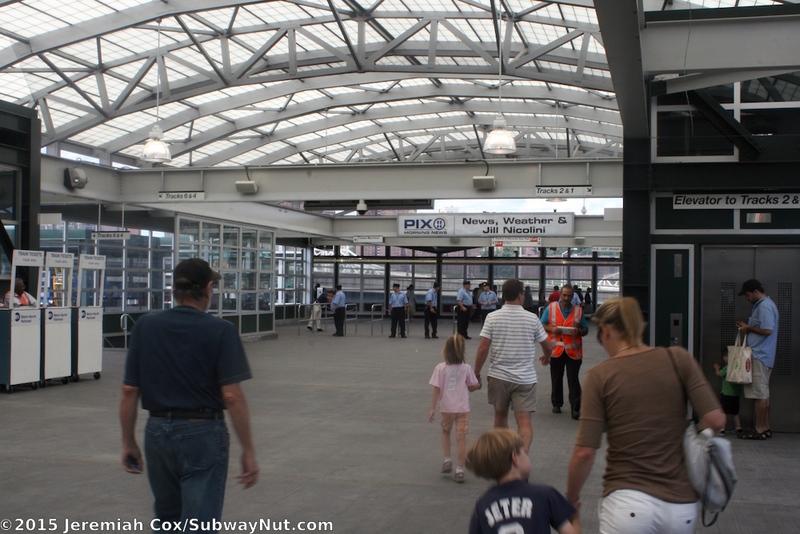 A final fun fact about the ferry dock is that all passengers must cross the CSX Oak Point Line that opened in 1998 and is directly along the Harlem River. 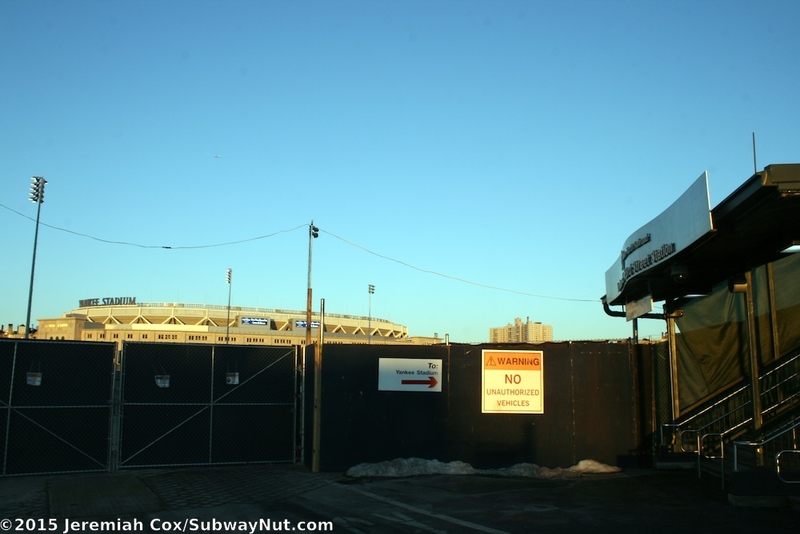 To reach the Stadium passengers go across a bridge the parking lot of a factory and East 153 Street, before stairs and elevator lead down to ground level by the Bat and where the home plate entrance once was to the old stadium. From here a sidewalk leads around Legends Field (the public ball field the old stadium has become) to E 161 Street and the new stadium that is directly across the street. 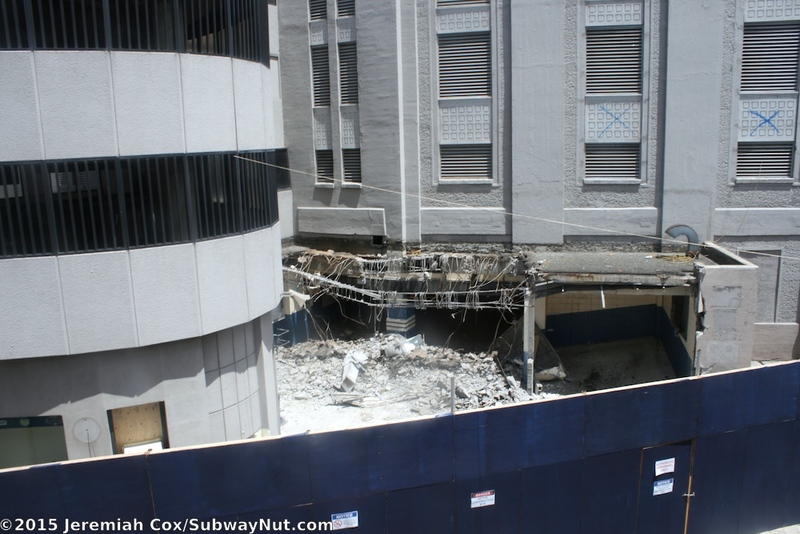 When the station first opened the walkway was narrow and around the construction fencing that surrounded the old stadium as it underwent demolition. The overpass and mezzanine have green walls and an airy white ceiling.